The Black Flag Shoppe in Clifton, NJ is one of the most chill and hottest shops around. Run by local love with upcoming and veteran labels, it's a breath of fresh air in Clifton. On any day you can see all the local skaters and neighbors pass thru to say wassup, and they are always greeted with mad love from the shop. Not just because they carry the hot stuff, but they keep real with it and the people here love em for that. Their motto is Shop locally, and it shows by carrying labels such as Better Days, Single Second, and Free Gold Watch, supporting the small labels is a real focus with BFS. So if your in the area be sure to stop by 244 Lakeview Ave, in Clifton, they will treat you right and have you dressing the good life. 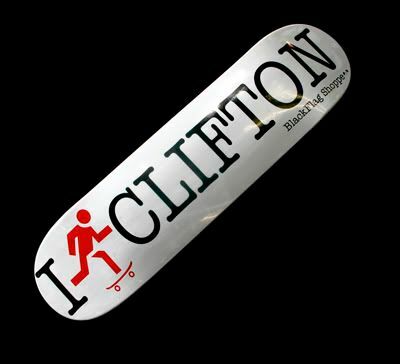 Go in and check out the "Rep your City" line of boards too, just in!